Trending at $111.33Trending price is based on prices over last 90 days. Trending at $83.50Trending price is based on prices over last 90 days. Canon IIB Rangefinder, MIOJ, with 50mm f/1.9 Serenar Lens, Filter, & Cap, Nice!! 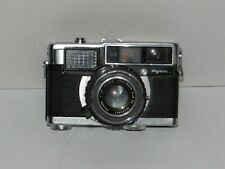 Olympus 35 RD 35mm Rangefinder Camera w/ F.Zuiko 1:1.7 40mm Lens; WOW! Trending at $75.00Trending price is based on prices over last 90 days.